I’m Sinking and I Can’t Get Out! 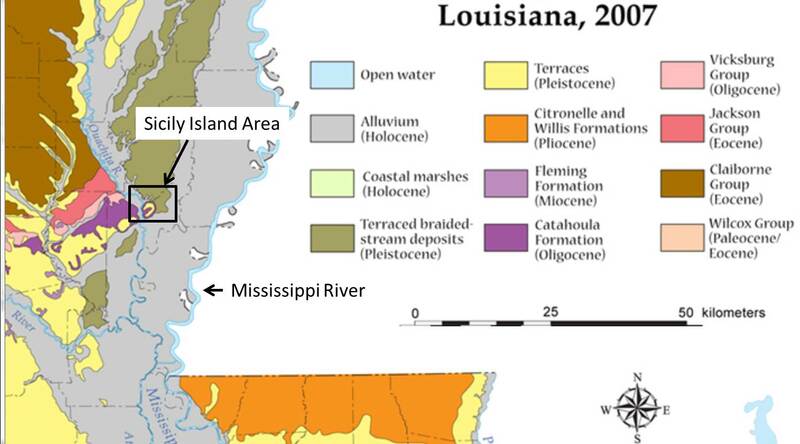 The other newsworthy geological process in Florida that has been going on (like an ox pulling a medieval plow) since Miocene time (23-5.3 MA) is the chemical dissolution of limestone (LS) by slightly acid rainwater. The geological term for these terranes is karst topography. 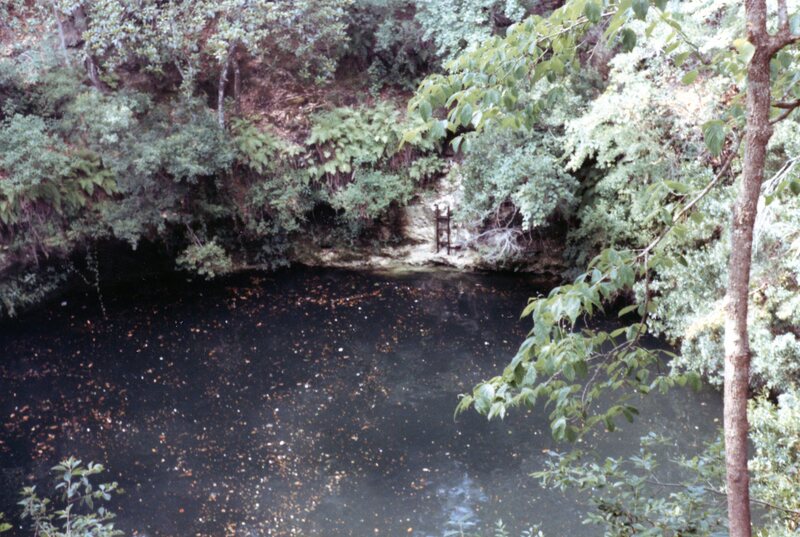 The end products of this dissolution over geologic time are features we call sinkholes. 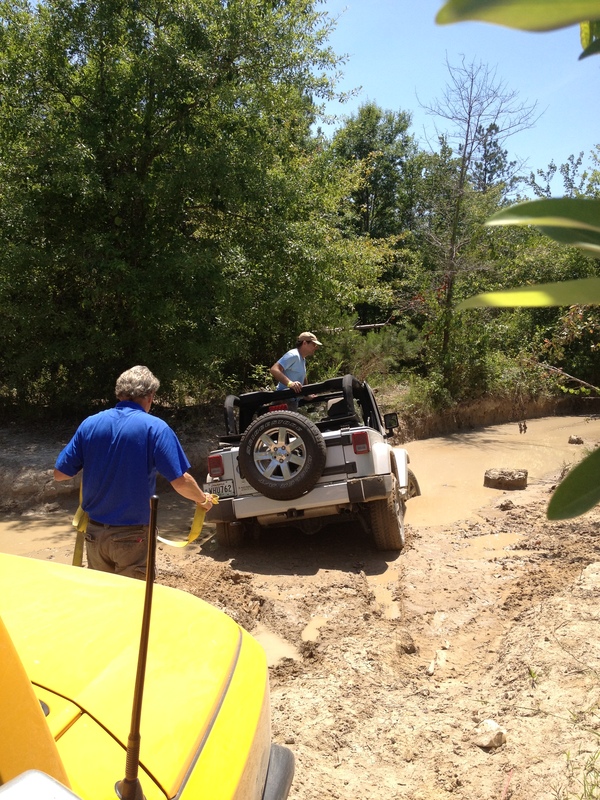 But sinkholes are also a lot of fun! The Fla. geologic map (below) shows that southeast of Tallahassee is a much older rock, the Miocene St. Marks Formation (symbol Tsmk on the map). These rocks are covered by a thin veneer of sand from when sea level was much higher (~300 feet at the max). The St. Marks Formation is uneven at the surface and these sinkholes can be quite deep, as seen at this monster that was called “Big Dismal” by the locals. 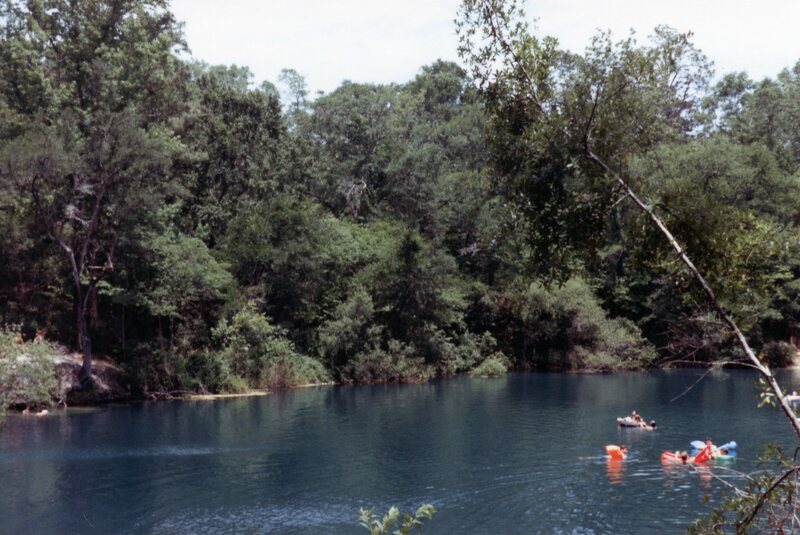 If you had the nerve, you could leap from a pine tree ~75 feet into a blackwater hole with floating logs. I didn’t make it, I must admit. Of course, not all sinkholes are so dark and hard to find. 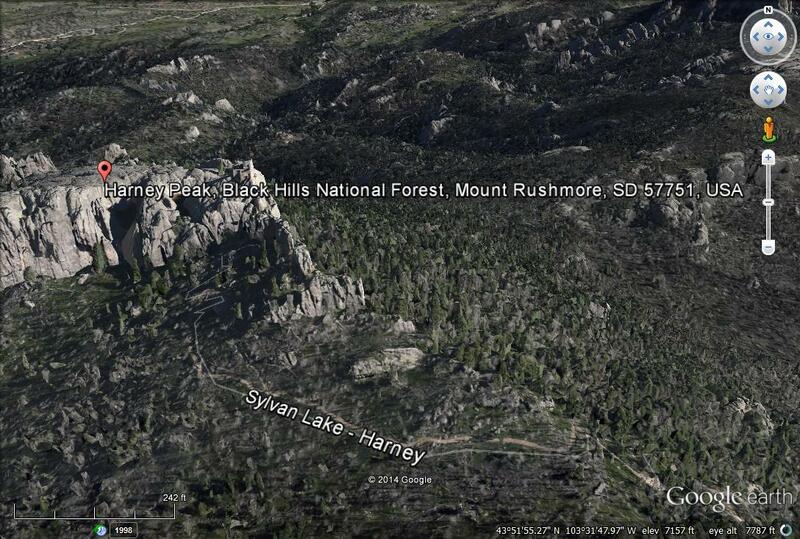 Cherokee Sink, which is actually known to Google Earth, was a favorite hangout for everyone. 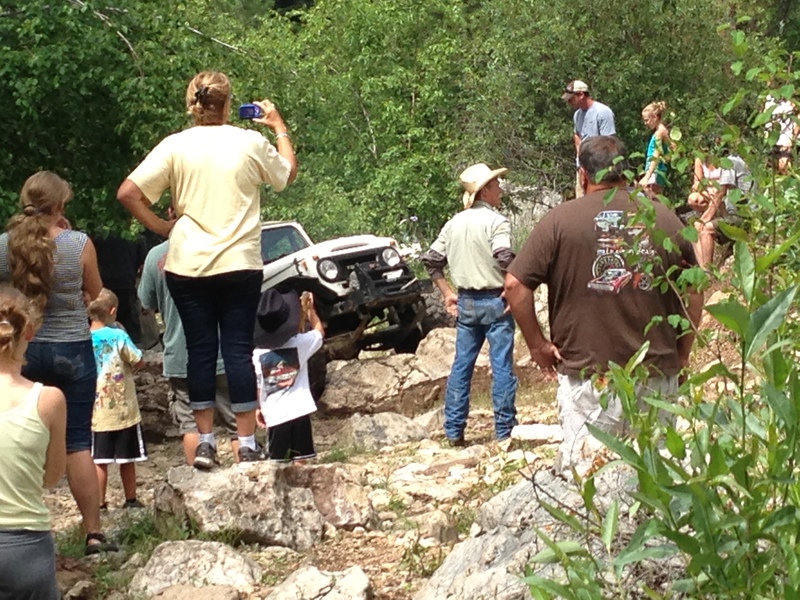 Lots of family fun in the pine woods. 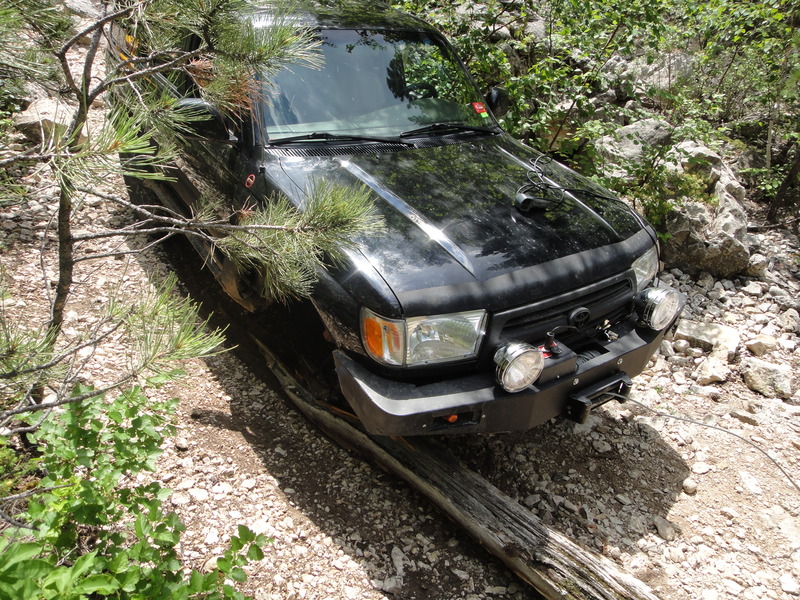 It was pretty easy to go out into the woods and need 4WD; I pulled a lot of 2WD vehicles out because the drivers’ miscalculated the lack of adhesion (and thus traction) in millions of individual quartz grains <1 mm in diameter. 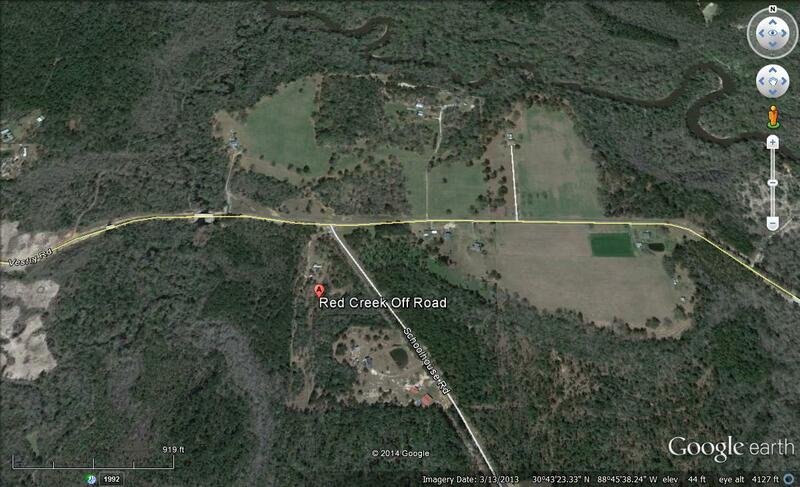 The Holocene sand sheet is slightly thicker west of Tallahassee (Qal on map) and has partly filled in sinkholes. This is also approaching the northern limit of the Miocene reef that produces the Karst terrane. 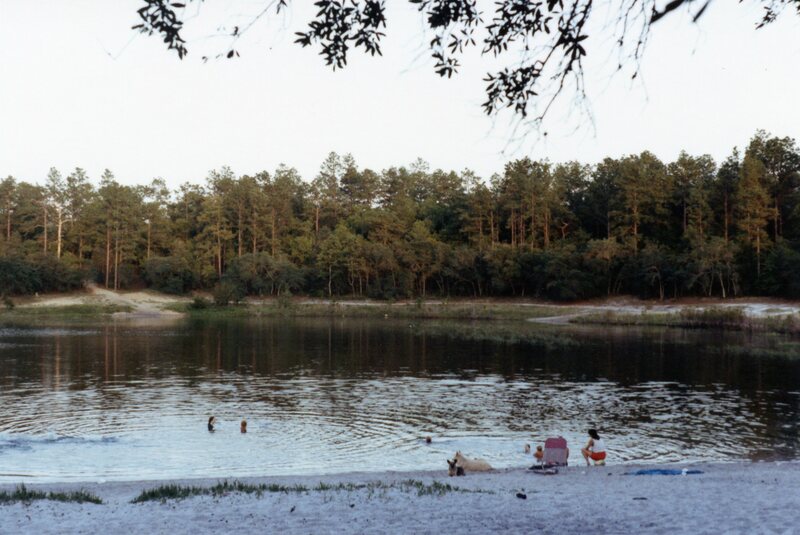 A good example is the happy hour fun place called Turtle Lake (note it becomes a lake when filled with sand). Sun, Sand, and Water: Florida Fun! The last posts showed that geology is everywhere and is going on today. It is easy to see when it occurs at short time spans like the ~12 hour tidal cycle in the Sea of Cortez (see previous post). This post continues this modern trend but adds some older geology too, and mixes water and sand some more in North Florida after I left Arizona and the Basin and Range for adventures east of the Mississippi River. 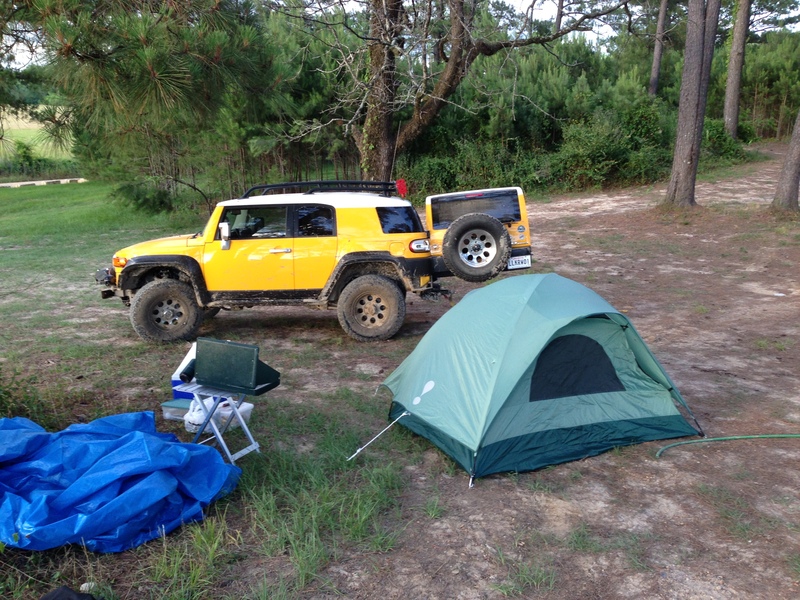 I packed up my stuff into my Jeep and an old military trailer and headed down Interstate 10 for 1891 miles. The geology of Florida is more varied than one might think, with visions of sand and sun, because it has a history just like every other place. 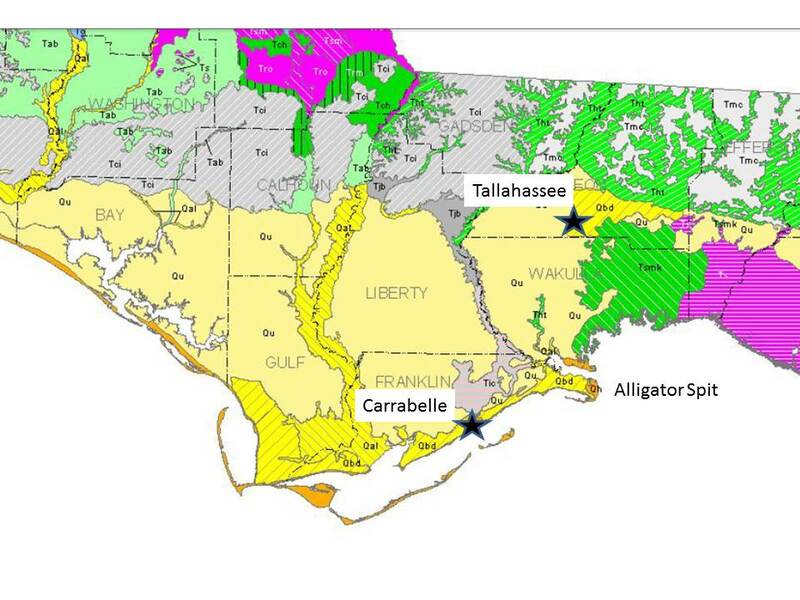 The Florida Geologic Survey map (below) shows several units that we will see on this trip. Actually, this post describes several day trips as well as long weekends. 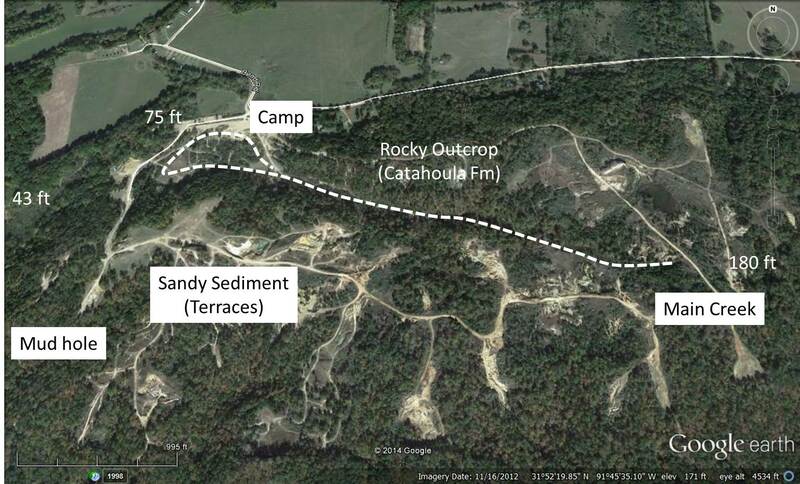 The rocks around Tallahassee consist of undifferentiated Pleistocene/Holocene sediment to the west (Qu on the map) and beach ridge and dune sands to the east (Qbd). The rocks are difficult to date so they are identified by context; these are younger than ~2.6 MA. 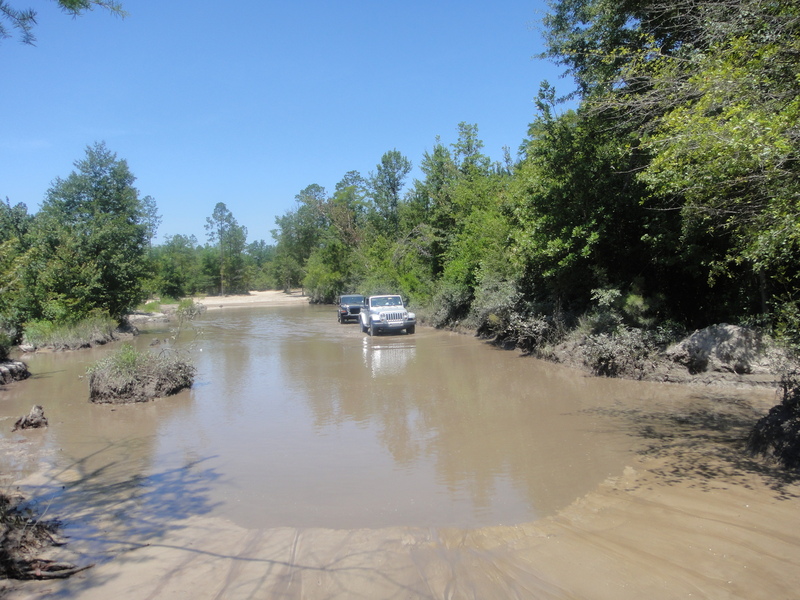 The ribbon of Qal to the west is alluvium along the Apalachicola River, which is still a major waterway today. 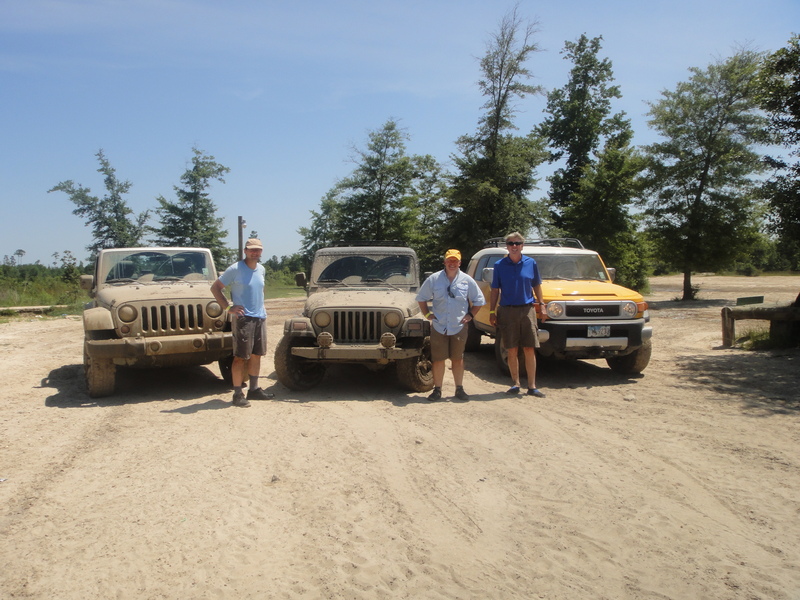 The first sediment we expect to see is a beach, right? 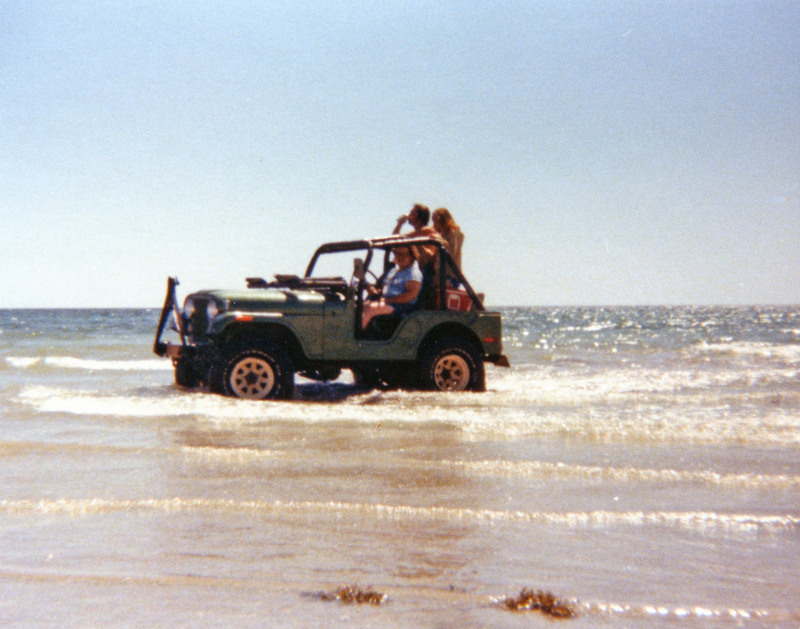 This is what we get at Alligator Spit, where we are allowed to drive on the beach (speed limit is 10 mph…LOL). Note how white the sand is. This is the medium sand from the Florida panhandle’s famous beaches. The sand grains are white because they are free of contaminants (e.g. the cement that forms a sandstone from individual grains). No one know how many times they have been on a beach but it has been at least 200 MA since they were part of sandstones in the southern Appalachian Mtns. The individual quartz grains are probably much older, maybe pC like some of the metamorphic rocks we have seen. 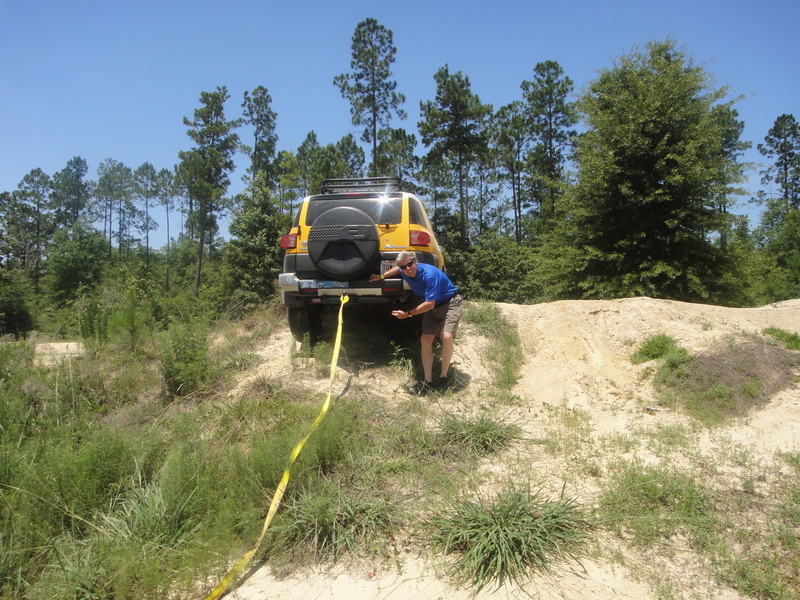 and, yes, you can go off-roading here too! I wonder if this guy is going boating? 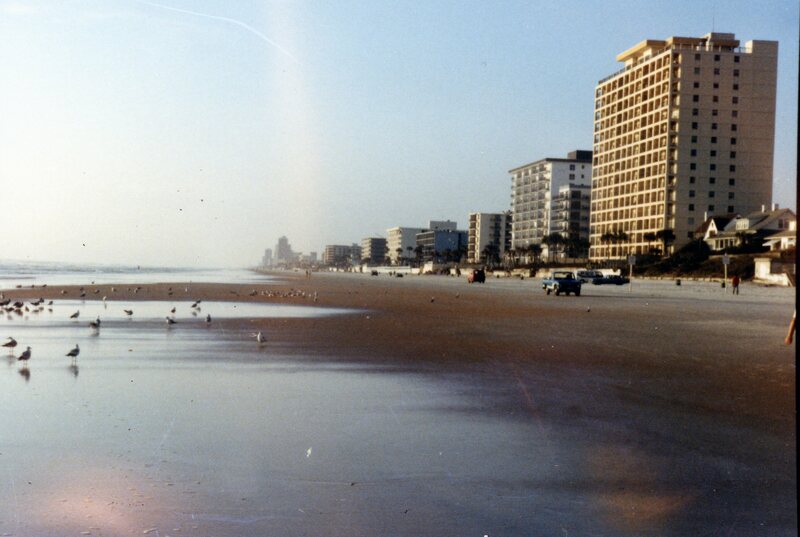 The sand along Florida’s east coast has been transported southward along the U.S. coastline by wave action in what is called the “river of sand“. These processes are also present in the Gulf of Mexico, but hurricanes are also an important geological process along those beaches. 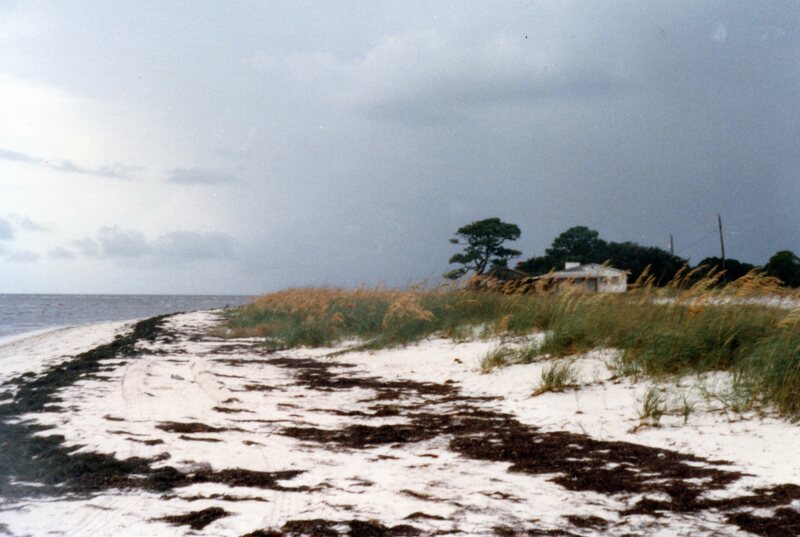 This photo shows a very low energy beach at Carrabelle (see photo above), but it doesn’t look low energy. That seaward bar looks a lot like the bars in the Sea of Cortez but the tidal range here is ~1.5 feet. This feature was deposited by Hurricane Kate in November, 1985. It was so strange that I earned an M.S. 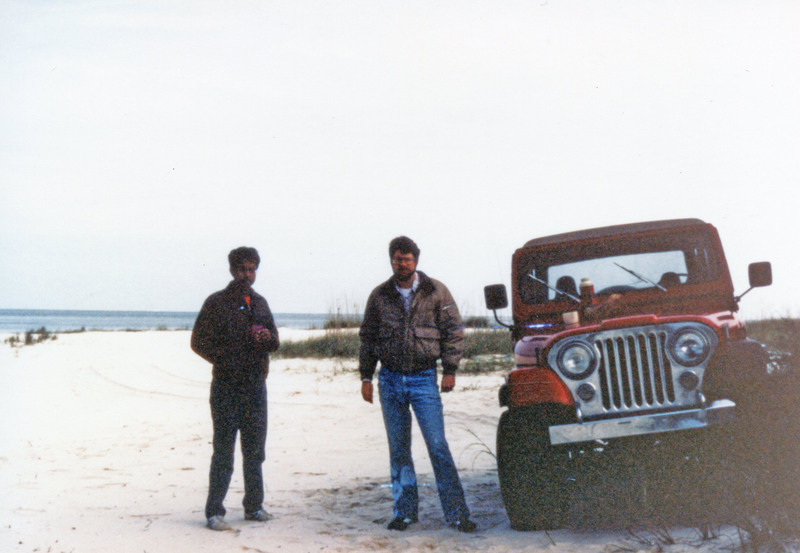 at Florida State University from studying it (Journal of Coastal Research, 2000). 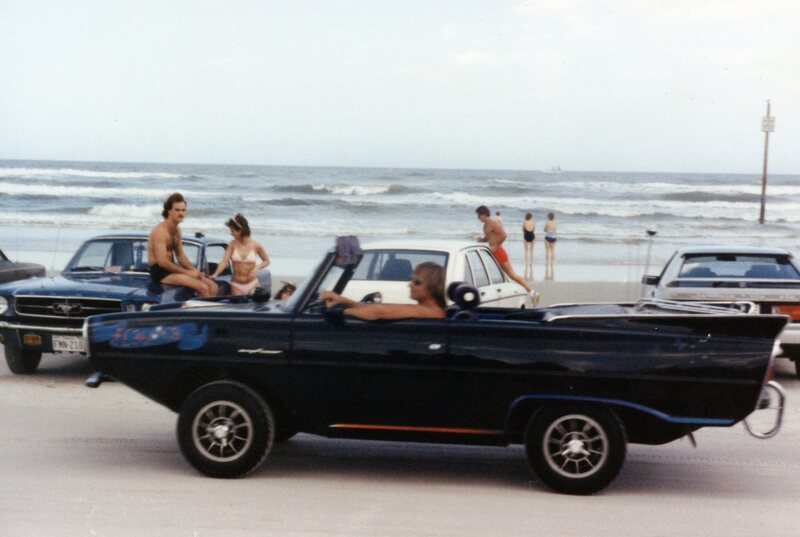 And you can even drive on Carrabelle Beach in January when no LEOs are around! Beaches are a lot of fun and very active, geologically, but this is Florida and nature has other ways of surprising us in the Sunshine State. 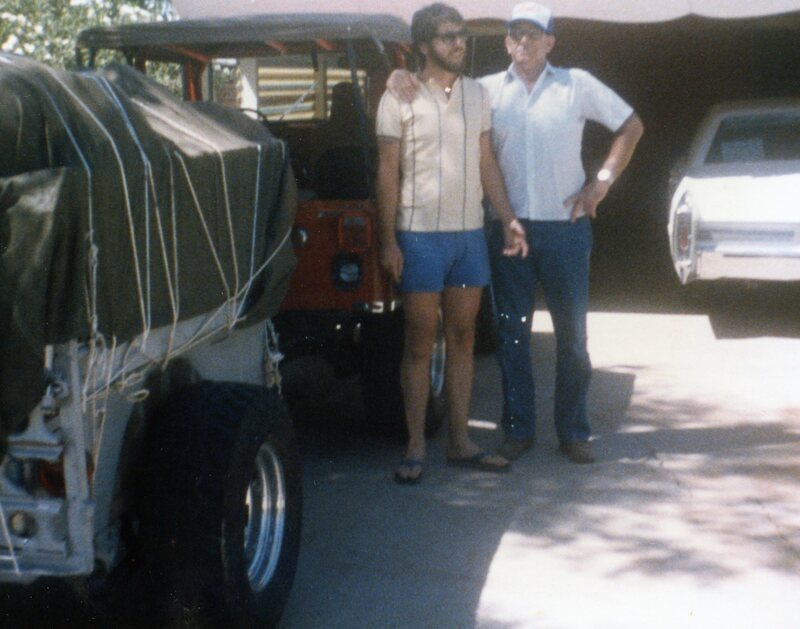 The next couple of posts are describing trips to northern Mexico between 1979 and 1985. 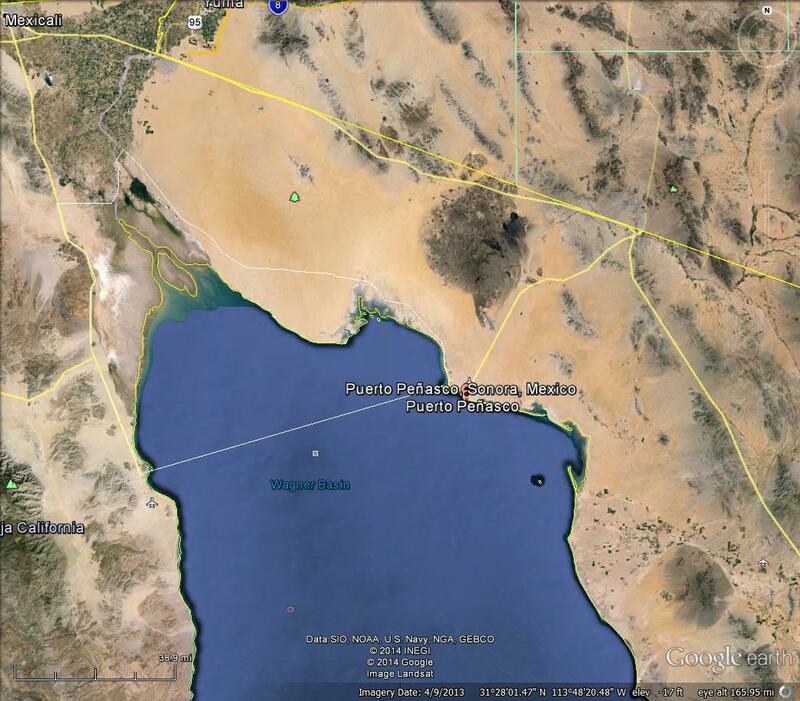 This is a fascinating area where the Colorado River enters the Gulf of California (Sea of Cortez). 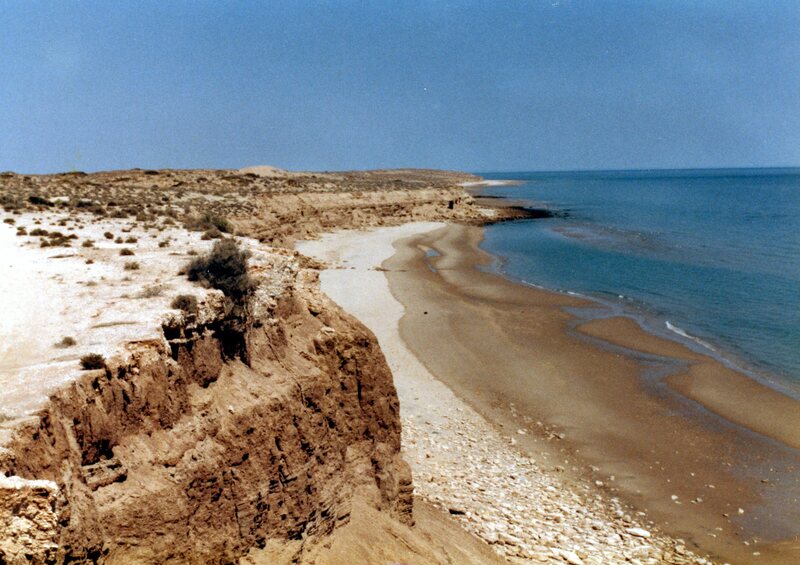 It also overlaps with the southern extent of the Basin and Range (B&R) province, as evidenced at Rocky Point (Puerto Penasco), Mexico. 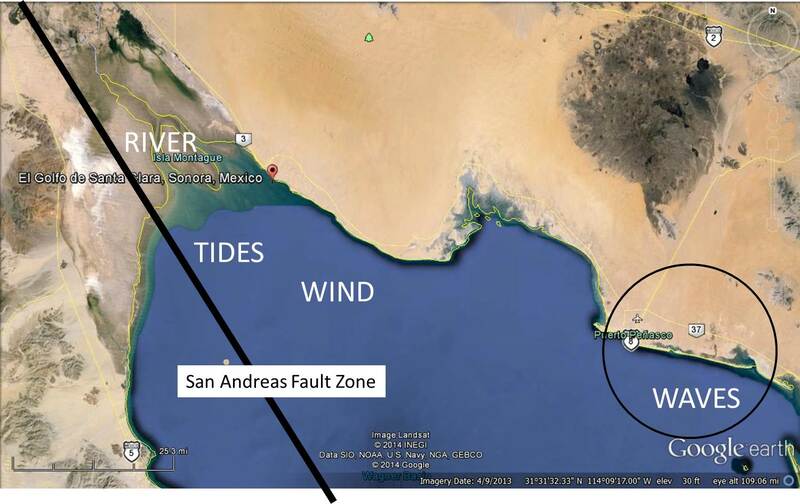 The western margin of this region is defined by the San Andreas fault zone, which created the Sea of Cortez within the last 7 MA (Pliocene epoch) as Baja moved northward. The overall geological setting is briefly summarized by Eugene Singer. 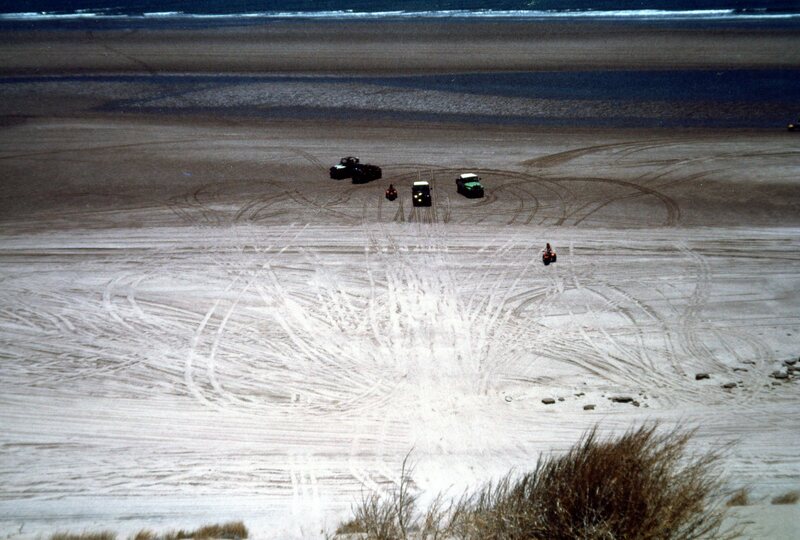 For our offroad interests, I will focus on coastal processes with some description of the southern extension of the B&R. 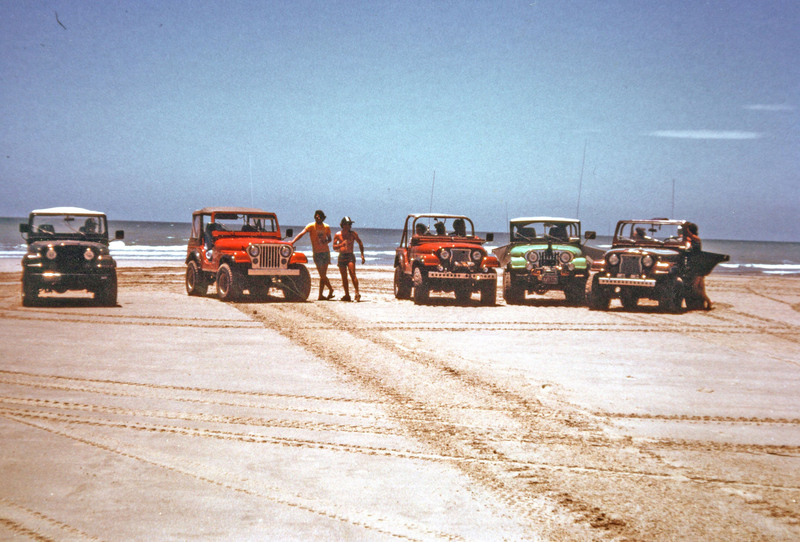 Subsequent posts will explore the coastline to the NW of Rocky Point. 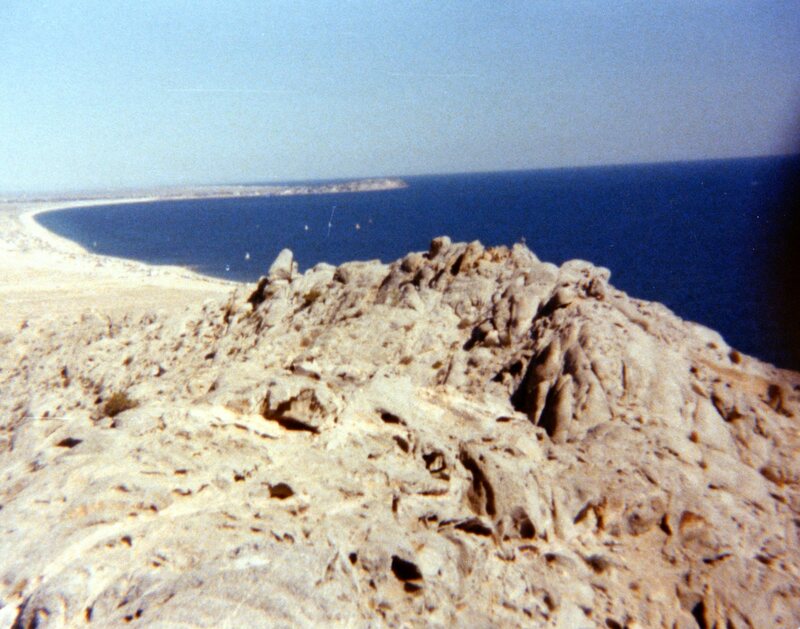 To get to Puerto Penasco, we cross the Sonoran Desert, which has numerous volcanic rocks and volcanoes; this image taken at the international border in 1979, shows some of the mountains in the southern B&R (probably Precambrian basement rocks). 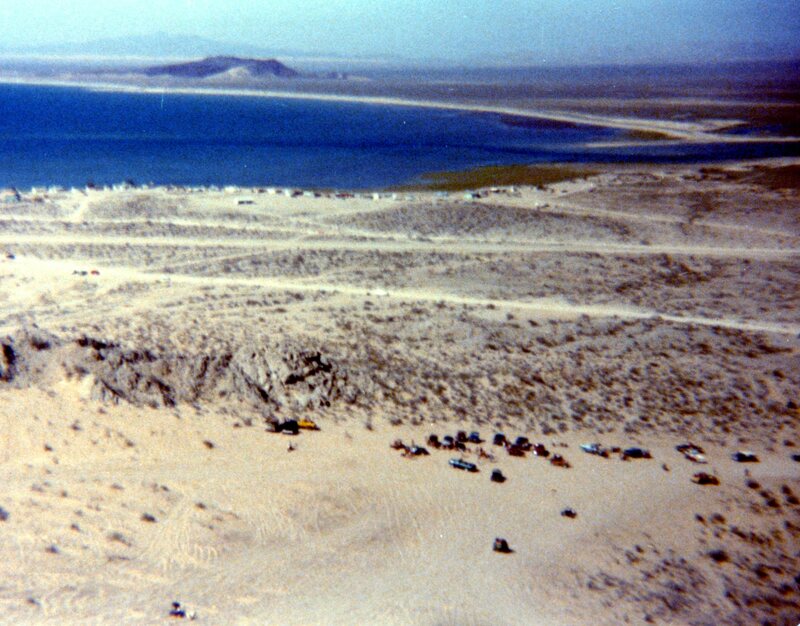 When we arrive at the northern end of the Sea of Cortez, we find a range of geological features formed by the Colorado River, tidal currents, seasonal southerly winds, and alongshore transport at the coast by combined tidal, wind, and wave-forced flow. 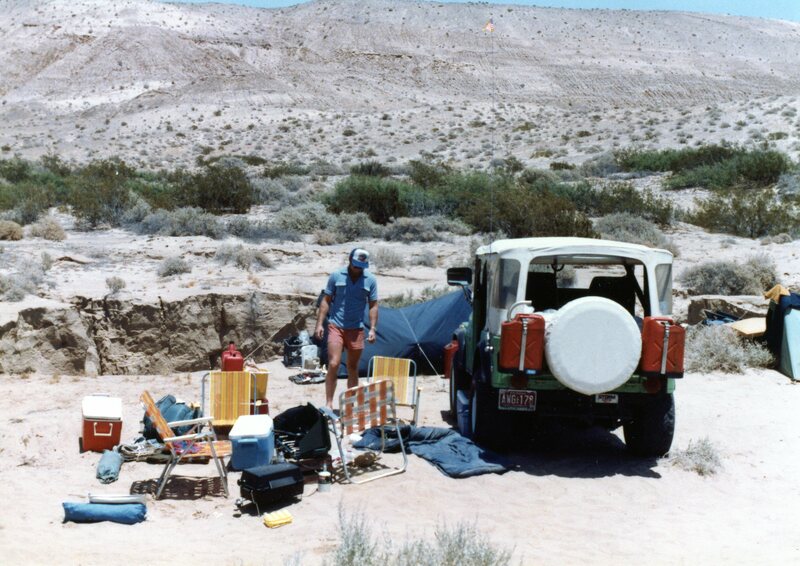 The image below shows the CO River to the NW and several Metamorphic Core Complexes (MCCs) and other basement rocks that were created as part of the B&R event. The Sierra Madre Occidental is an extensive mountain range to the southeast with elevations of <5000 feet. Rocky Pt. is an alternate (colloquial American) name for the town of Puerto Penasco. This region has been explored for a variety of minerals, especially evaporates like borates. 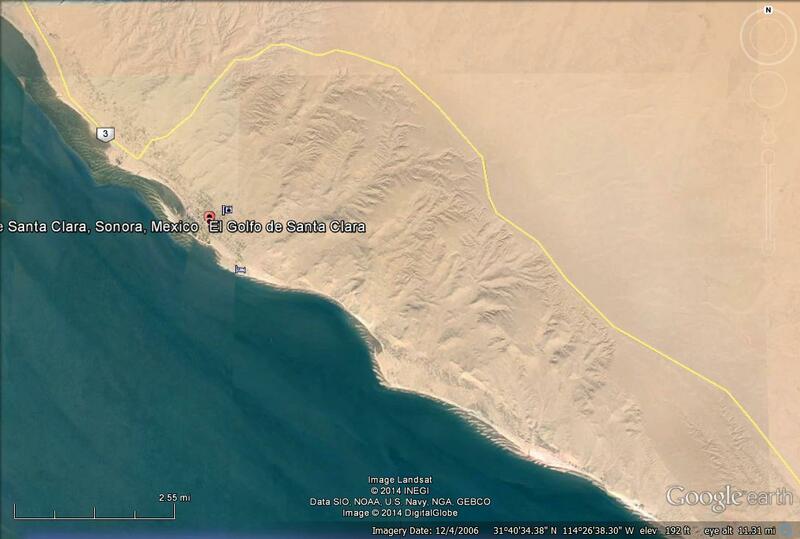 The town of El Golfo de Santa Clara is located at the mouth of the CO River. 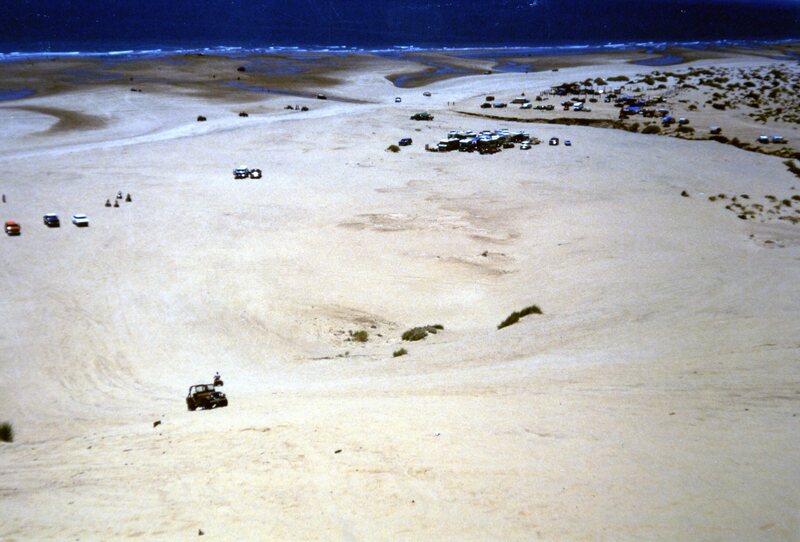 This is also a favorite resort area, which is near a field of large sand dunes at the coast. It will be discussed in the next couple of posts. 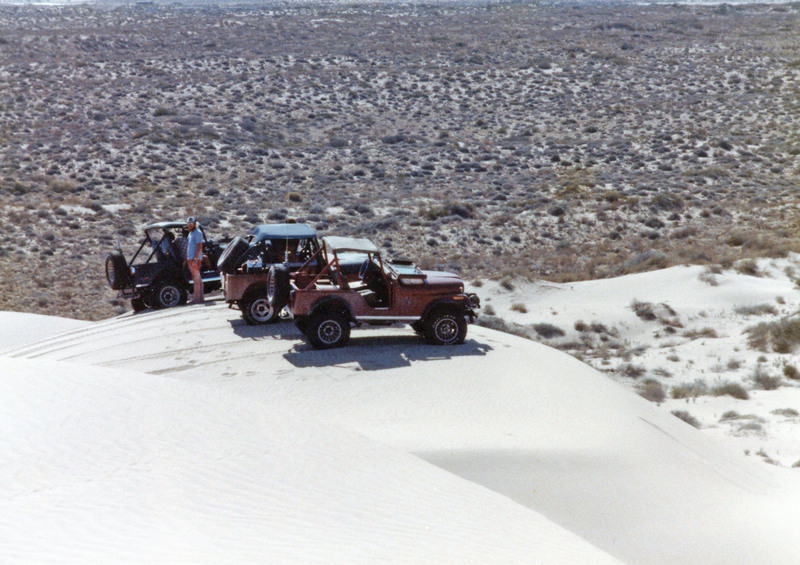 This close-up shows Cholla Hill, where thousands of Americans congregate every Easter and enjoy a wide range of water and land activities, including offroading. The top of Cholla Hill is ~330 feet but it is located directly on the coast. Cholla Hill is an outlier of the B&R with pC granite and metamorphic rocks visible at the top. There is also a breathtaking view of the coast. The first image is looking to the NW towards the CO River. 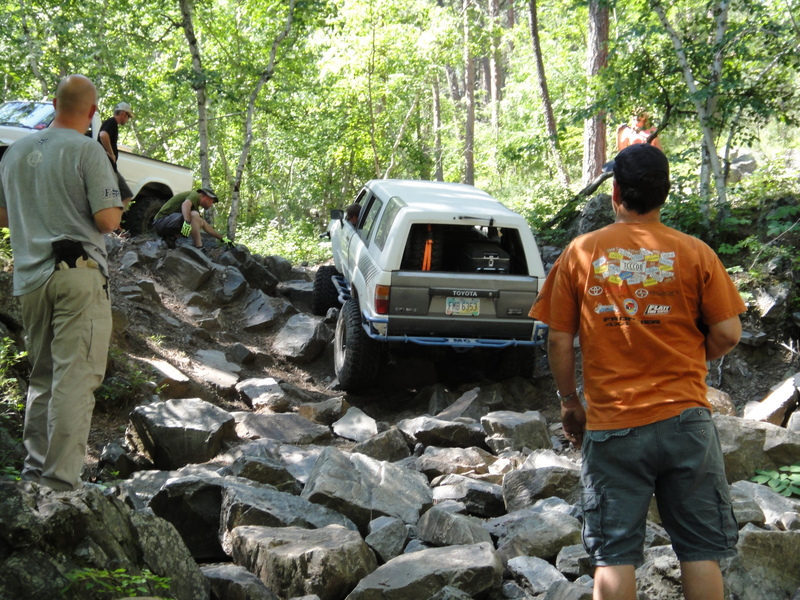 The degree of erosion of this quartz-rich (granite/metamorphic) rock is evident in the sandy ramp that leads almost to its peak, which is a favorite sand racing spot. 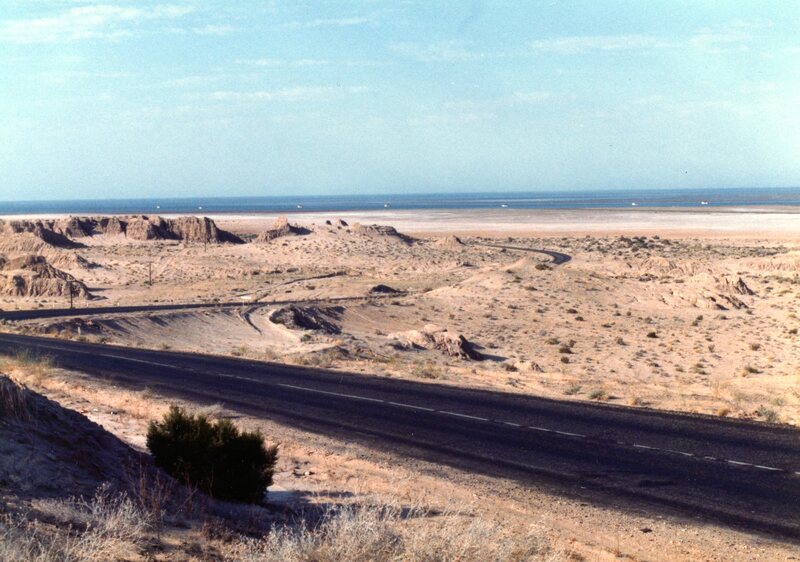 The image below is to the SE, with Puerto Penasco in the distance. This is a major spot today for U.S. holidays. 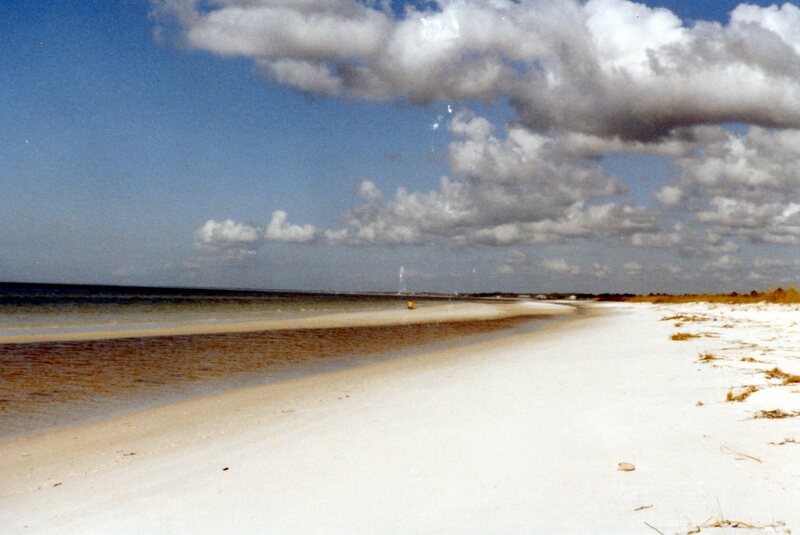 The beach is very sandy at this location and the tides are not too large. We have a very different story in the next posts. 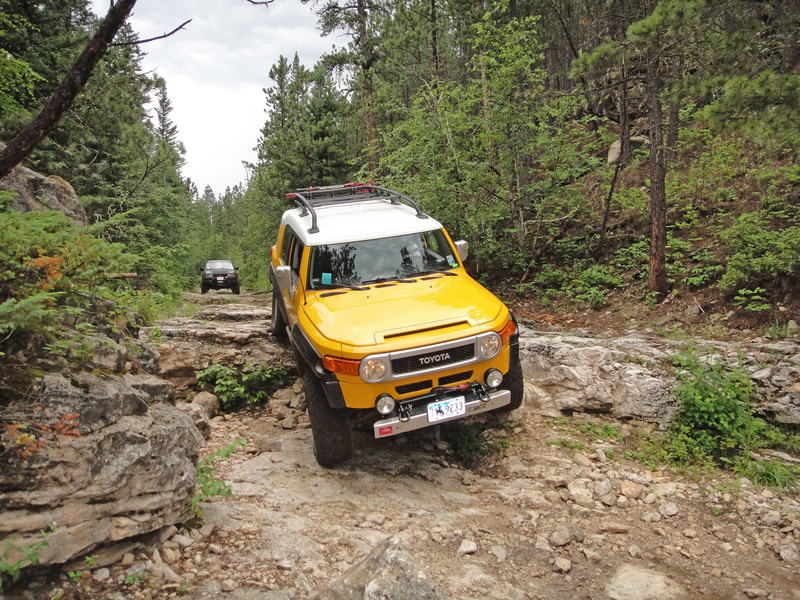 The next day came with no permanent damage but a set of badly damaged wheels, seriously dented muffler and tailpipe, and pieces of FJ Cruiser plastic missing. Today we were doing the Iceman trail (rating 4), which means hard but not fatal most of the time. 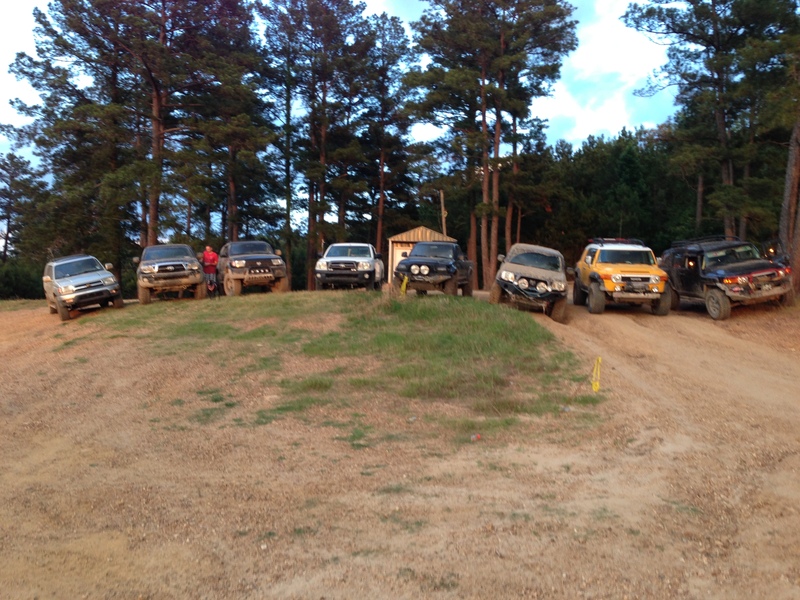 The same group showed up so we were getting used to it. 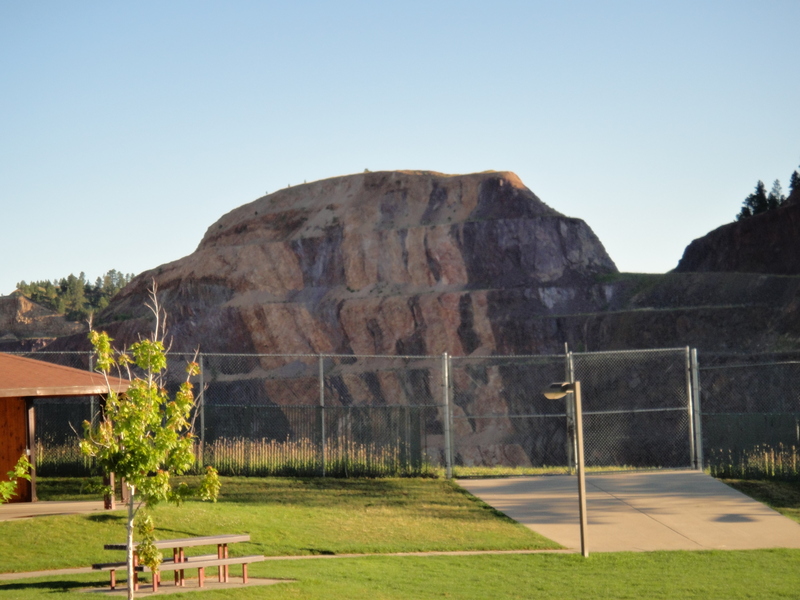 Iceman is located in the Paleozoic limestones that form the sedimentary cover of the Black Hills Pluton/Batholith complex. Here is the overview image that shows where Iceman is located. 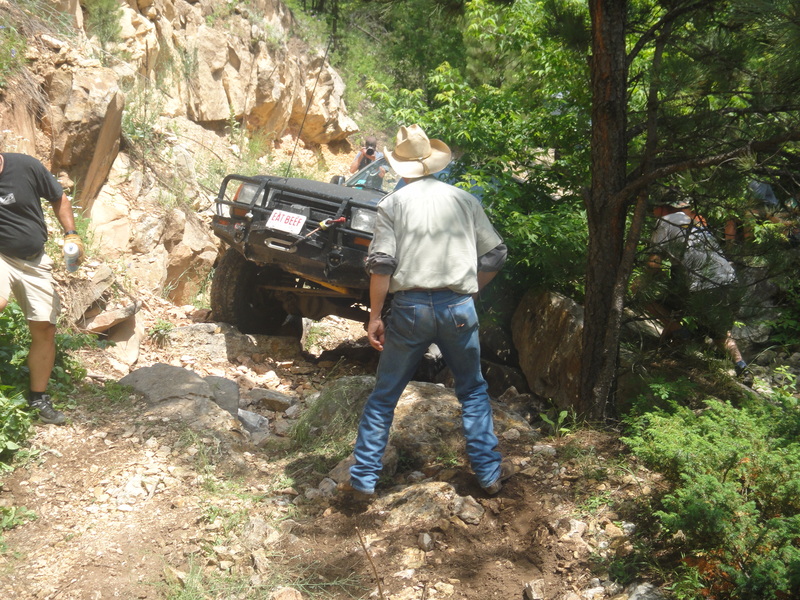 This trail starts out in a wide( ~300 yd) entrance to a gently sloping canyon. It traverses the nearly horizontal limestone and we negotiated a series of ledges that got progressively higher downhill. The trail ends at a very narrow entrance to a fissure that our guide, Raylon, said he walked once when he broke down here. 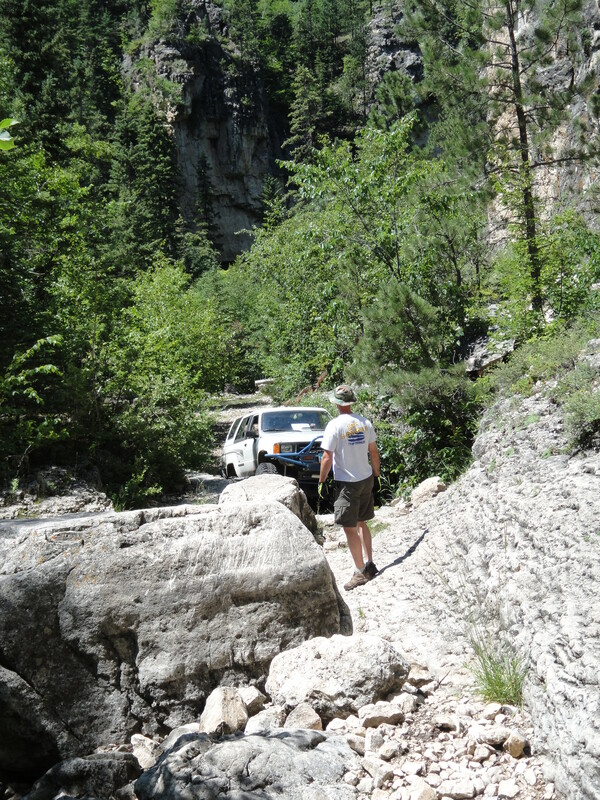 He informed us it could not be negotiated by any vehicle and was difficult even on foot. The limestone forms ledges where water flows over it and thus the name no doubt comes from attempts to negotiate this creek/stream/glacier? when ice is still present. 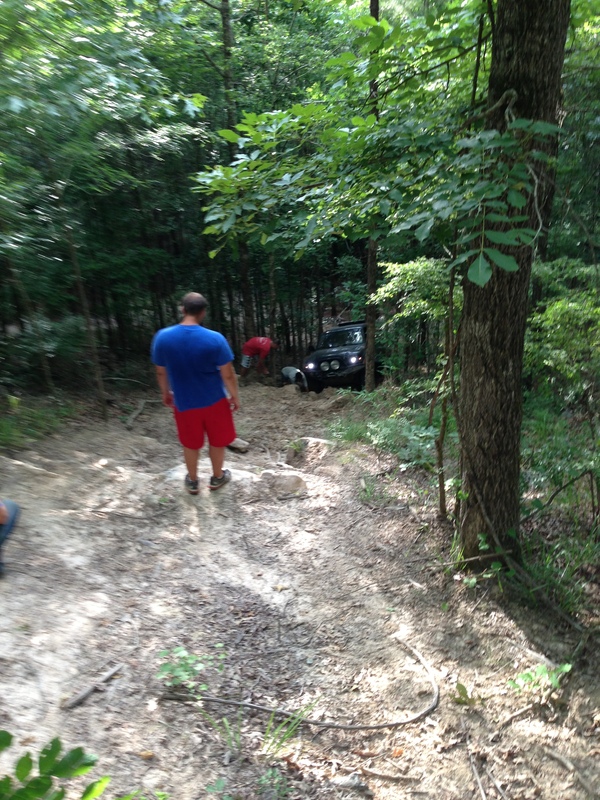 We had an epic failure of the IFS on Rayon’s Forerunner and left it on the trail. I had to show you this image, which shows the extremes we go to when a non-field-repairable vehicle blocks the exit (like pushing a damaged aircraft over the side of a carrier). 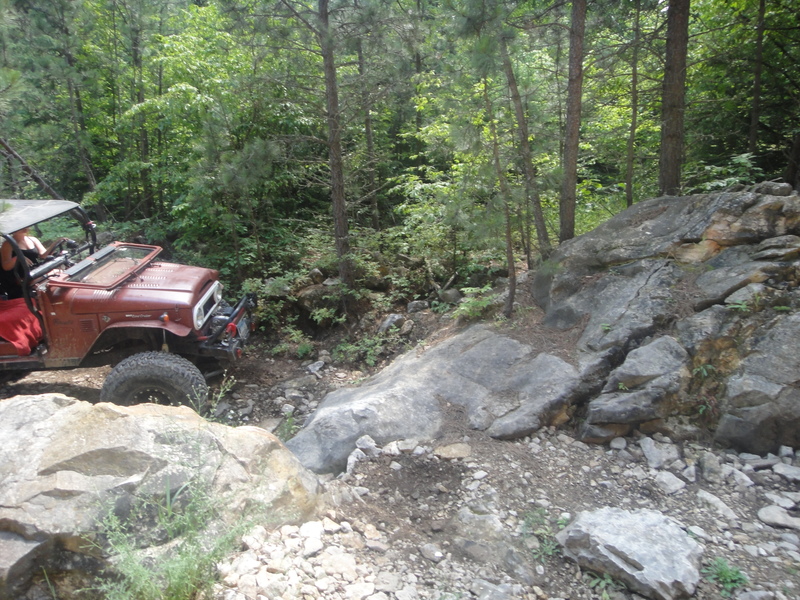 We had to climb those LS (limestone) ledges to get out, and it was obvious that others hadn’t thought that far ahead from all of the ramps that had been constructed to ease the exit. Note the ramp built of cobbles used on this ledge as I descend it. Two last points about LS; it is not as hard as granite (i.e. quartz, which has a hardness of 7.5), with a hardness of only 3.5 whereas steel is ~5-6. However, it has a higher density (specific gravity ~3.2) than quartz (sg =2.65), so it bends steel better than granite, which just cuts through metal! 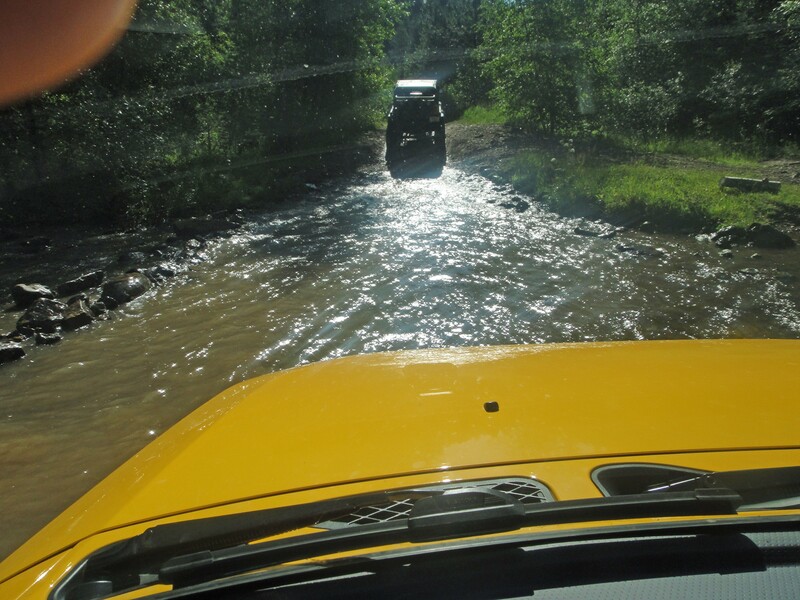 It sprinkled and sleeted as we drove back up Iceman, thus earning the name, and the exit was now a slippery muddy slope that required full throttle by everyone to get out. The reward was happy hour at a drive-in straight out of Happy Days or American Graffiti. 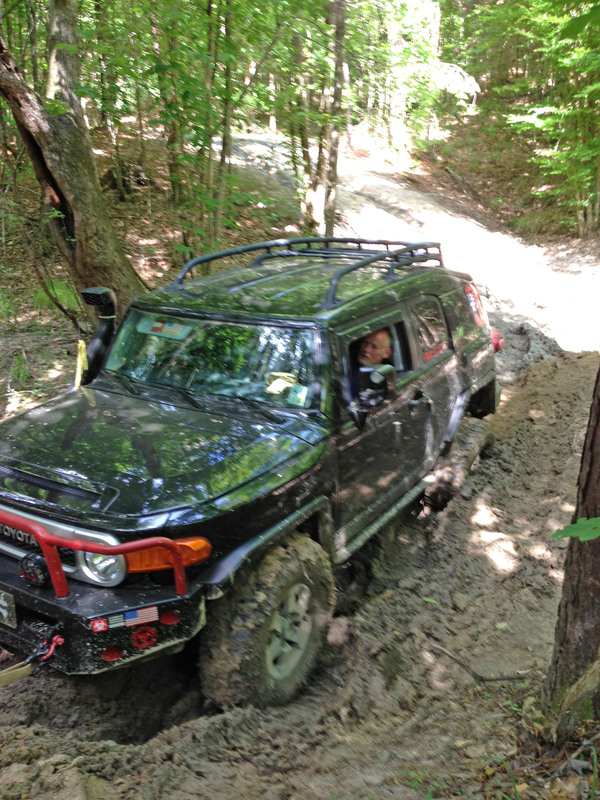 One final word; only damaged the muffler some more and learned how to drive the automatic transmission over rocks while using the sliders to wedge the FJ through narrow openings. 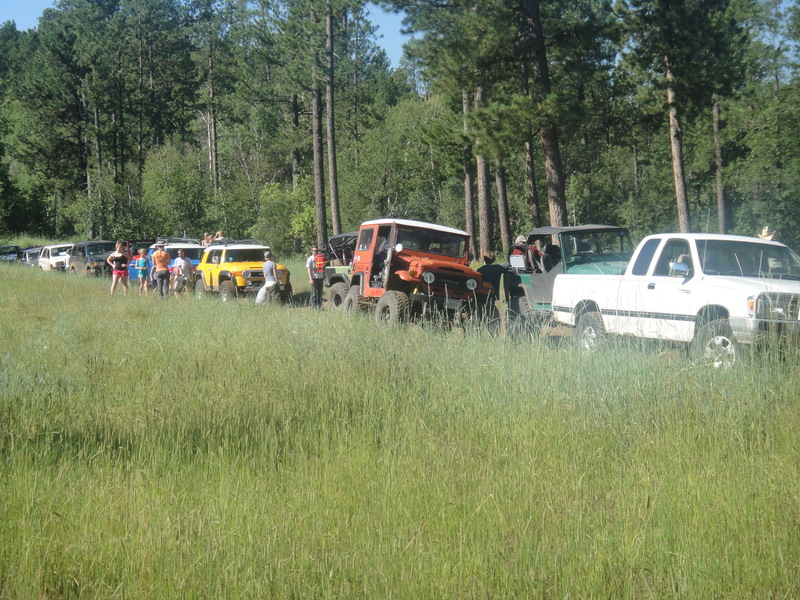 The next couple of posts are describing a trip I made in July 2013 to the Black Hills Cruiser Classic (BHCC). This first post describes the geologic and social settings in getting there, which is ~1500 miles from home. 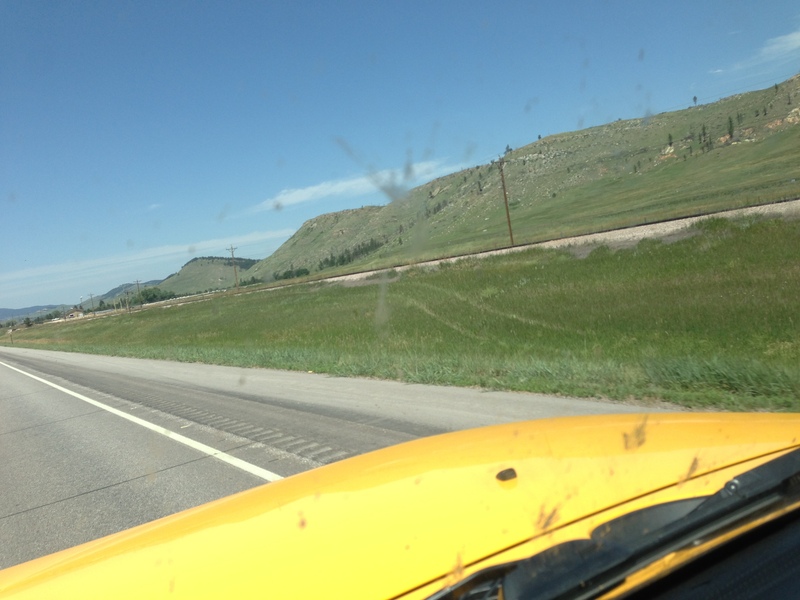 This post is kept brief by referring to our Family web page for a trip we took in 2010 (timkeen.net), as well as the excellent Roadside Geology of South Dakota (J. P. Gries, Mountain Press Pub., Missoula, MO). After driving across the coastal plain into Arkansas, I turned west at Hot Springs and drove along the axis of the Ouachita Mtns, which bisect AR. 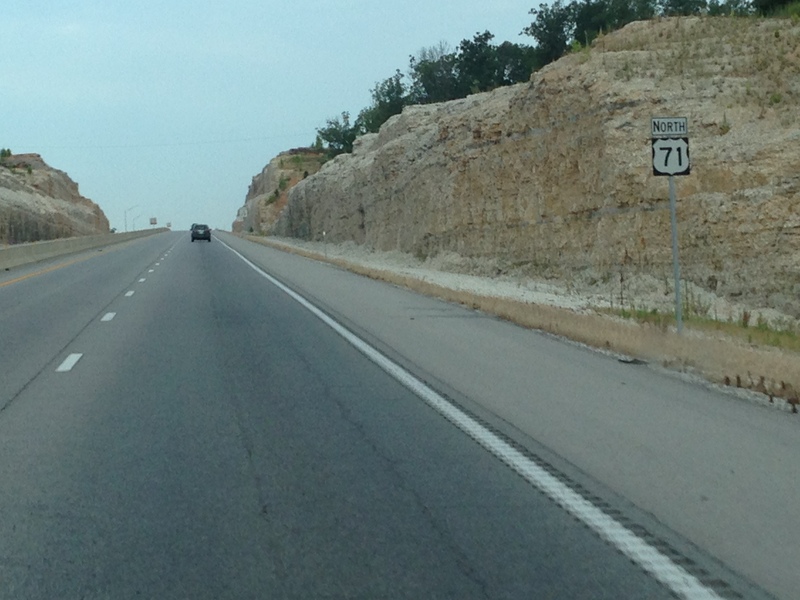 I began the northward trek when I intersected US 71 N and traversed the Arkansas Valley as well as the Ozark Mtns in the north. 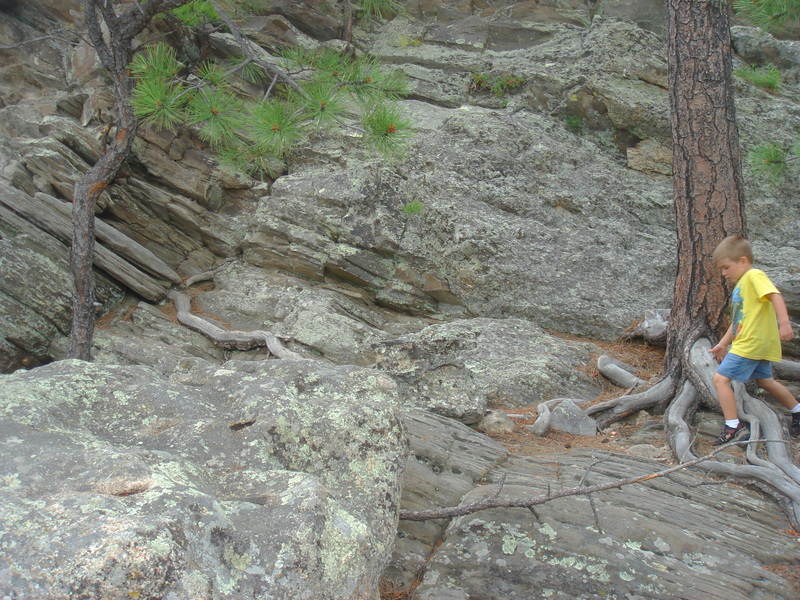 Paleozoic limestones are nearly horizontal in this area, with erosion being responsible for the steep grades seen in this image in the AR valley province (terrane). I crossed the Missouri R. at Kansas City and stayed to the east of the Great Plains following the same route we did in 2010. This choice followed the bluffs along the western border of Iowa and stayed close to the river, which allowed me to review my history by visiting a MO stated park dedicated to the Lewis and Clark expedition. I wish I could go up the river in a boat like this reproduction; that would have been cool. Instead, I continued north and spent the night at one of my favorite American traditions, a small motel in the middle of nowhere. I think I could have driven thru the walls, they were so flimsy–like the sign (does that say Bates Motel?). 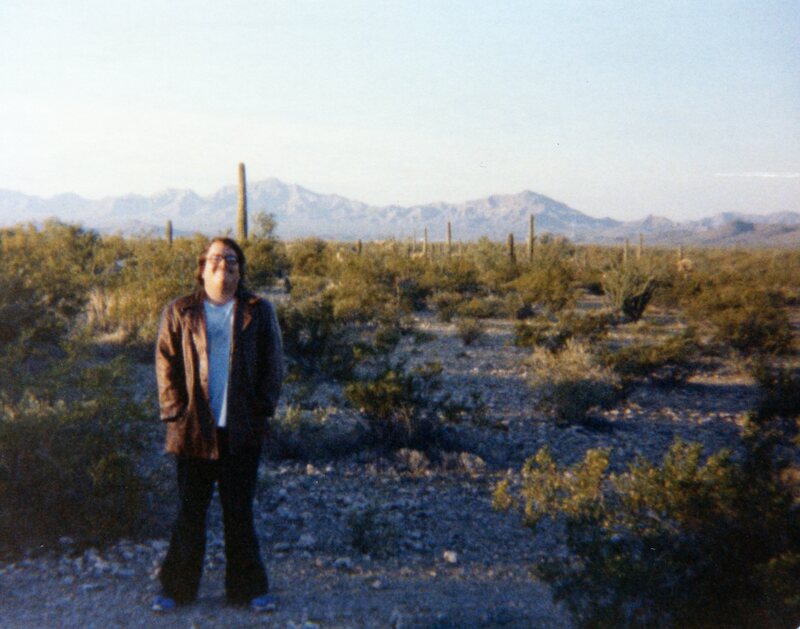 The next day I crossed the northern Great Plains on the Pierre Shale. This is a Late Cretaceous (66-90 MA) mostly clay formation that was deposited by the inland sea that covered the entire central US at that time. It has irregular landscape because of glaciation between ~200 and 15 KA. It is just plain flat today, except for the Missouri R. valley (timkeen.net).